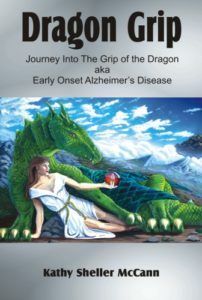 Dragon Grip by Kathy Sheller McCann is a journey into the grip of the Dragon aka Early Onset Alzheimer’s Disease. In Dragon Grip you get to “live” the Alzheimer’s life. It isn’t glorified, or made pretty, if that could even be possible. It is an actual account taken from Kathy’s personal journal.